I took this in July 2010 whilst on a walk around the Grasmere area (Lake District, England) a day after very heavy rainfall. I was trying to capture the motion in the river, so set the shutter speed to about 1/3 sec. I'm quite happy with the effect that this gave, but can't help but feel that overall, the image is a little flat. I love the Lake District. Lush green valleys, soaring peaks and of course lakes. There's a reason for all this lush beauty – rain! And unfortunately for every day of sunshine in the Lake District there must be four of rain. Well, at least that's what it feels like! When the sun does finally show itself it does look gorgeous. Really stunning scenery. If you're interested you might like to know that the area was shaped by glaciers during the last ice age. For the photographer it's a joy when that sun does come out. But capturing that beauty is more difficult than you might imagine. One photography technique is to focus on smaller details. This involves seeking out one aspect of the scene to fill your photo with, rather than attempting to capture everything with one shot. Dai I think managed this quite well. 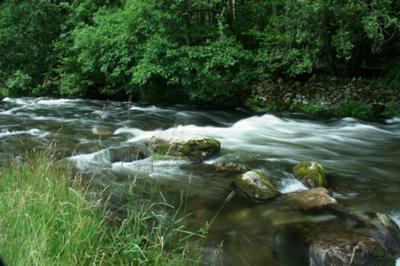 The stream was an attractive element of the scene, so good to concentrate on that. And if the stream needs a little 'pepping-up'? Well, there's a photography technique for that as well. And Dai has used it here – slow shutter speed. When you use a slow shutter speed anything that moves while the shutter is open becomes blurred, and anything that was stationary remains sharp. In Dai's photo the water has moved and is blurred but the rest of the elements in the photo have stayed sharp as they didn't move. It's a nice technique and one photographers have been using for years. But as Dai says himself, something is missing. The thing that's missing is some background to give the scene depth. In this photo there is grass, river and a wall of trees. And that's it. There needs to be something else in order to 'place' the river. It could be a mountain in the background, some sky with some nice fluffy clouds. I would suggest getting closer to the river and photographing it at more of an angle (so that it flows from the top left to bottom right of the picture, rather than straight across the middle). This sort of angle should provide an opportunity to include something in the background of the photo. Upstream there must have been a line of trees, a sweeping bend in the river, hills...anything that would give a feeling of depth. 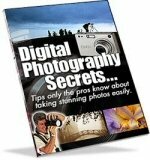 Discover the secrets of professional photographers! Join in and write your own page! It's easy to do. How? 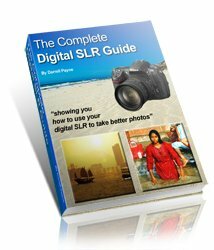 Simply click here to return to Digital photography tutorials - submissions, Autumn 2010.